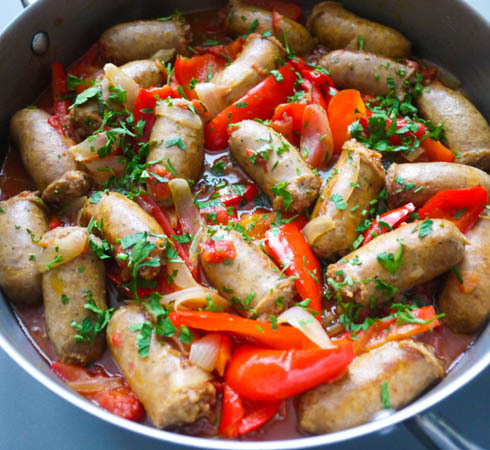 I adore Italian food – pizza, pasta, sausage and peppers, garlic knots, you name it! During college, my family went on a trip to Rome. I spent most of the time leading up to the trip mapping out the location of restaurants near our hotel, that’s how excited I was to eat authentic Italian food. I imagined it would be like New York City food-wise, only with everyone speaking Italian. Imagine my surprise when I first laid eyes on a piece of Roman pizza. I was baffled to see that pizza in Rome was served in a square shape and eaten like a sandwich with two slices stacked on top of each other. I was expecting the giant, thin crust pies with slices as big as my head like they serve in Brooklyn. And I thought I knew the texture of good al dente pasta, but the pasta there was almost crunchy. Ha! It was my first lesson in “authentic” food not meaning the same thing all over the globe. Sometimes you just want what you’re used to. 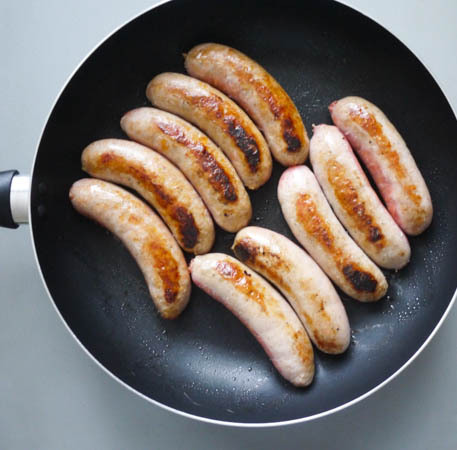 Place your sausages in a large nonstick pan. Brown them on both sides. You do not need to cook them through, you just want the outside to get a nice color and sear. 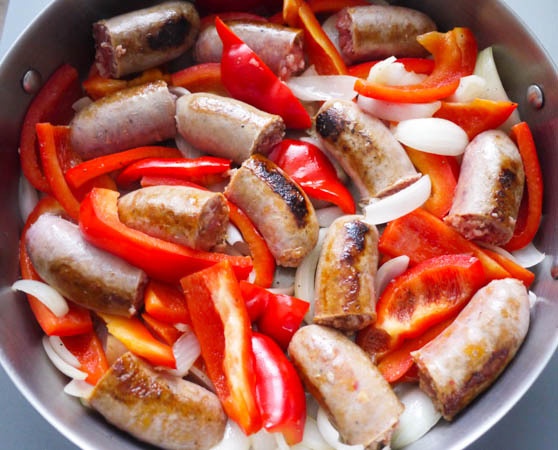 Remove from the pan and cut each link in half. 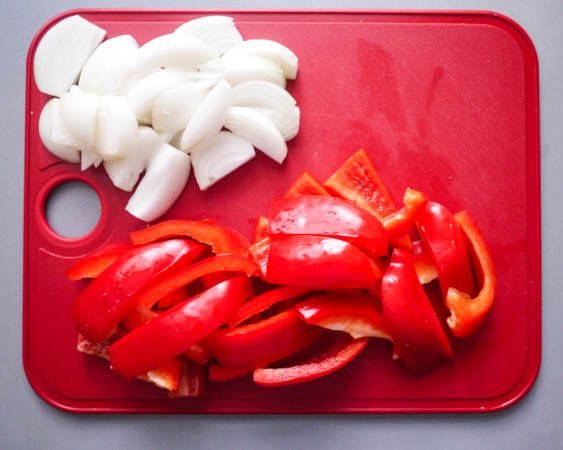 Slice your bell peppers and onions into thick slices. 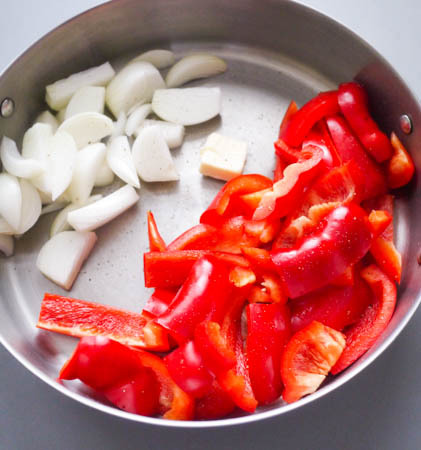 Add peppers and onions to a large pan with 1 tablespoon of butter and a sprinkle of salt and pepper. Cook on medium high heat for approximately 5 minutes, stirring occasionally. You just want the veggies to start to soften. 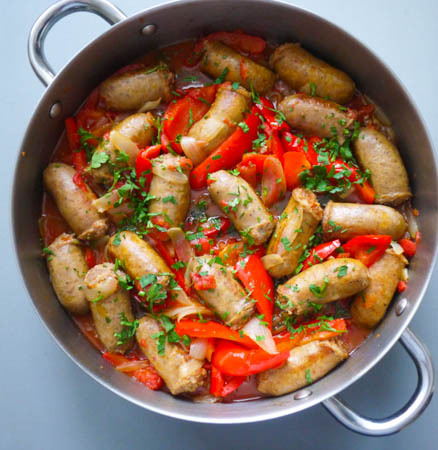 Snuggle your italian sausages back into the pan with the onions and peppers. Pour in your diced tomatoes and white wine. Sprinkle with Splenda. 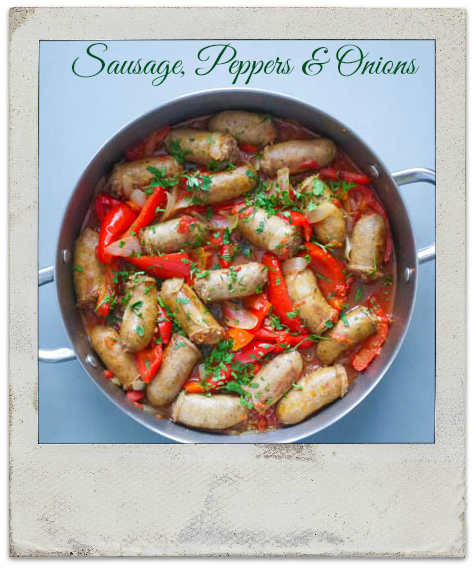 Cover and cook for approximately 20 minutes, until the sausages and veggies are completely cooked through. Remove the cover, raise the heat to medium high, and continue cooking for approximately 10 minutes. During this step, we want to reduce the gravy by half, so the flavors are concentrated and the volume doesn’t drown out the other ingredients. Spicy and sweet italian sausages in a mellow tomato-wine sauce with sliced bell peppers and juicy onions. Remove the cover, raise the heat to medium high, and continue cooking for approximately 10 minutes. During this step, we want to reduce the gravy by half, so the flavors are concentrated and the volume doesn't drown out the other ingredients. We love the absolutely Beautiful vibrant colors bursting through the dish. It looks yummy! 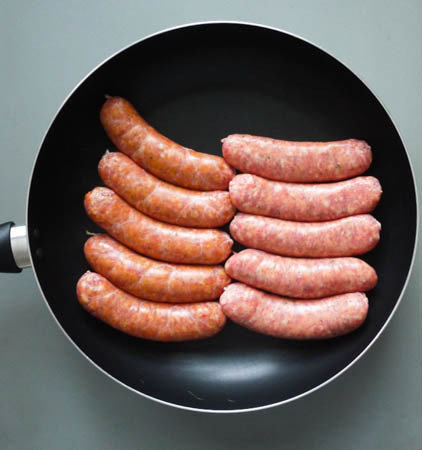 What do you serve the sausage with? Yes, we remember our trip to Rome and how surprised we were to see how Pizza was prepared there. 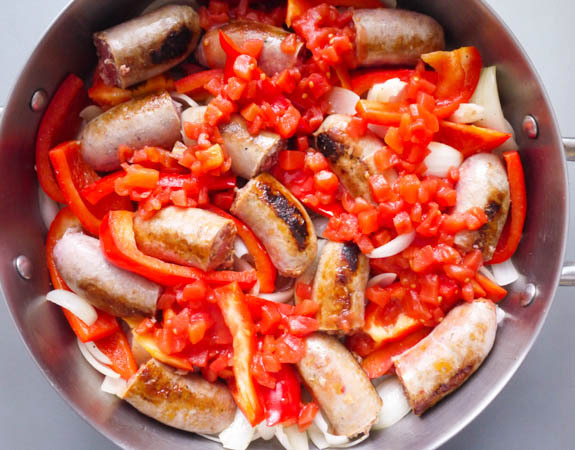 Overall, we love your Italian cooking the best! Thanks, Mom! 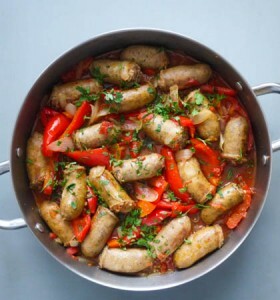 We eat it by itself, but you could serve it with toasted garlic bread for sipping into the sauce or with rice or over pasta or in hot dog rolls or even over a salad with italian dressing. Okay! lots of choices to go with that dish!